No tools, wiring, or outlet needed! Why fumble in the dark getting out of bed or walking down the hall? 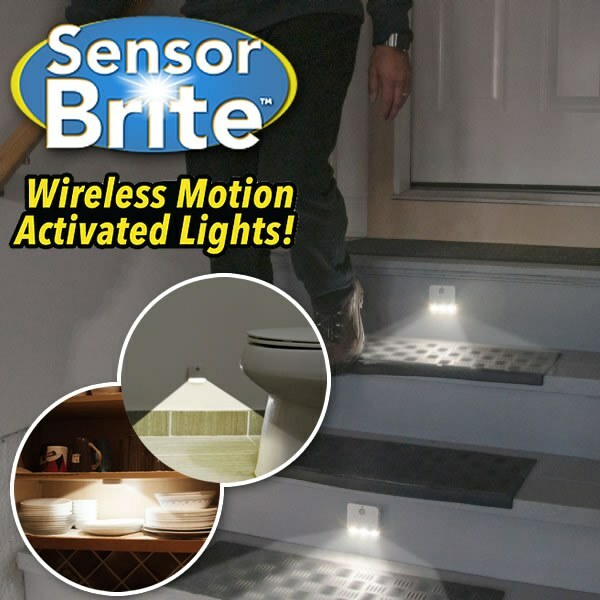 Let Sensor Brite light your way! Sensor Bright is a motion-activated, light-sensitive LED that turns itself on and off, so you only have light when and where you need it! No outlet or wiring needed with these battery-operated stick-anywhere lights. Just peel and stick to virtually any surface wherever you need extra light. Use several and create a light path to guide you safely on steps and hallways without having to flip on switches. Use in cabinets and cubbies to light up dark areas, and they are great in bedrooms and nurseries for ambient light that will not wake others. Perfect for the shed or garage. Put these on cupboard doors on the spice cabinet. Now when we open the doors we can see all the spices! Works great! Awesome product. Great item to give as a gift. You will love it! These lights are surprisingly bright. Really helps light up front steps to porch. Very sensitive to motion. Lights turn on in plenty of time as you&apos;re approaching them. They are GREAAAt. Just ordered more. Loveeee this product. Can&apos;t wait till they become available again. Plan to order atleast 10 more. Best product I ordered yet. Have it on my entry door, over look and sensor work great, gives me "bright" light. Love it. WOW, love these things. Need more!! Wow! I love them so much. I bought 3 sets of 2 sensor brites. I put these on by the stairs. So Cool! Very good product.. I use them everywhere!! I bought qty of 2 and 1 didn&apos;t work at all.